Former Illinois Gov. 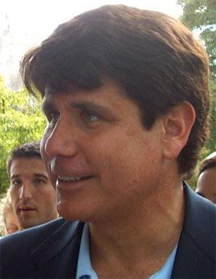 Rod Blagojevich. A textbook example of the snatchback can be found in the closing statement of Illinois Gov. Rod Blagojevich at his impeachment trial: "I want to apologize to you for what happened, but I can't because I don't think — because I didn't do anything wrong." (see "Rod Blagojevich impeachment trial closing statements," at WikiSource) In this form, he begins by delivering what sounds like an apology, but then he withdraws it. Prior to the withdrawal, he leads the listener into an apology experience, which cannot be fully undone by the withdrawal. Photo by Erik Abderhalden courtesy Wikipedia. For protection, to express contempt, or to accomplish by subterfuge what one cannot accomplish openly, we mask the true meaning of our communications. The masking technique depends on the message and the audience, but the practice is rarely constructive. It usually makes or expresses trouble for the relationship. Here are some examples of techniques for masking messages. Example: "It's painful for me to attend her meetings, because my own are so much more orderly and effective." This isn't merely a description of pain; rather, it's a claim about the quality of the speaker's meetings. But the claim is buried in a subordinate clause, where it's far less intrusive. Example: "If what I said offended anyone, I'm very sorry." This isn't a true apology, because it doesn't concede that what was said was offensive; it dissociates the speaker from what was said; and it isn't directed to anyone specifically. It's simply an expression of regret. See "Demanding Forgiveness," Point Lookout for June 18, 2003, for more. Example: "You can join the team if you promise not to pout if your ideas aren't accepted." If the accusation had been stated directly, it would have read: "I've noticed that you pout if your ideas are not accepted. You can join the team if you promise to behave." The implicit form creates an urge to refute it, which risks validating the claim. See "Dealing with Implied Accusations," Point Lookout for January 10, 2001, for more. Example: "Your leadership lately has been very useful." This message begins in the right direction, but ends with a dull thud. For extra thud, the speaker might pause before "lately" or after "very" as if to be searching for sufficiently neutral words. Example: "On project after project, he has demonstrated an outstanding ability to conjure up plausible-sounding explanations for even the most complicated blunders." Here the critique is hidden behind what appears to be praise. Example: "If you were to take responsibility for sorting out this mess, how would you do it?" By seducing the listener with a fake hypothetical question, the speaker hopes to nudge the listener toward a commitment to take responsibility for a mess. Example: "I'd like very much to offer you a promotion…but it had to go to another department." A snatchback happens when the speaker begins with a welcome pronouncement, but ends by explaining something else or providing an excuse. The message recipient experiences the positive pronouncement for a second or two — an experience that is never truly erased. Would you like to see your comments posted here? rbrenkTJuFKYizfucPOHZner@ChacbArmzSihttIVHzVOoCanyon.comSend me your comments by email, or by Web form. I offer email and telephone coaching at both corporate and individual rates. Contact Rick for details at rbrenyCNOoTdUUBIVXYwQner@ChaclMRXEVdNmhbHXcPxoCanyon.com or (650) 787-6475, or toll-free in the continental US at (866) 378-5470.